My piggies’ book is almost finished. Only have to paint the cover. Here’s the first round for the cover. 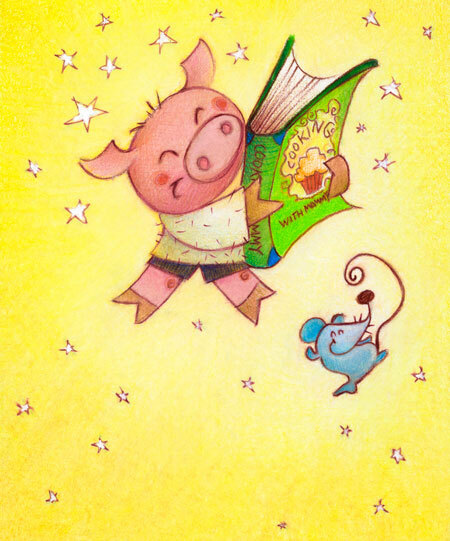 Piggies for all interior pages are being scanned as I write. Should get them back on Thursday. Boy, I miss them. A pretty bad scan of page 6 below. Aren’t they happy? Forgot to mention that Mami Pig was changed. She gained a few pounds and lost the stars on her head. She’s still cute, though. I’m seeing piggies everywhere. Literally. I’ve been busy trying to finish my first all educational book – ‘I Can Cook’. 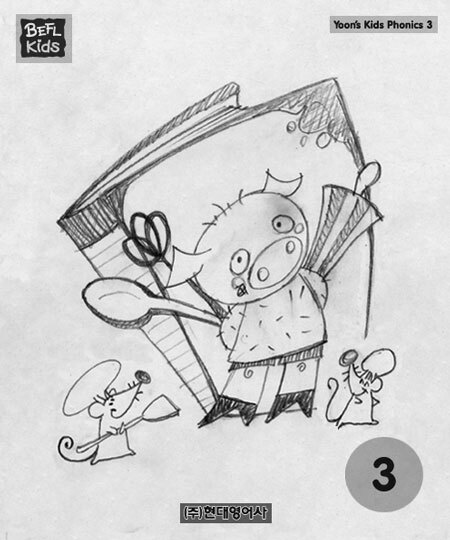 And piggies can cook. Good for them. I can’t and that’s why I have a nanny. I adore her. Charaters below. I’ll post a couple of the final illos in a few days when they are scanned.